We often talk about video's potential for keeping customers engaged on your site for longer amounts of time, but video is also a killer inbound marketing tool to be used as a point of entry to drive customers back to your site. The purpose of inbound marketing is to get found by customers. Instead of seeking out target audiences and blasting "push" messages, inbound marketing relies on subtler "pull" tactics, drawing in customers with engaging, sticky content when it is most relevant to their needs. (Check out HubSpot resources for an in-depth definition of inbound marketing practices). This post walks through a few of the fundamental reasons why video rocks inbound marketing. The combination of moving images and sound remains one of the most suitable vehicles for delivering compelling content. It's up to marketers to create value-adding content that entices viewers to see what else you've got to offer as a company. Inbound marketing videos aren't your traditional 30-second advertisement spot; videos are how-to instructions, they are episodic, they expose privileged behind the scenes insights about companies and operations. It's not the hard sell; instead inbound marketing videos are more like an amuse-bouche to pique the appetite of the customer and keep them coming back for more. Online video platforms and video sharing sites have transformed video's portability on the web, making each nugget of content inherently embeddable and modular. The ability to embed video gives you more mileage out of the quality content you've pulled together. And you don't need to be a sophisticated coder to be able to copy and paste videos into your site, and the same is true for the rest of your audience. Data from TubeMogul (a Brightcove Partner) shows that after basic search on video sites themselves, videos are most often discovered from blogs or other pages where they are linked to or embedded. Exposing your embed code is the fastest way to send your message out beyond your site to reach customers where they spend their time. Here, Reebok repurposes its TV spots on their Facebook Fan page, turning outbound collateral into inbound traffic-driving video that brings loyal customers back to the shopping site with featured products and calls to action. Likewise, fans of the videos can click "get code" or "get link" to share the video themselves. According to comScore, Facebook is now the fourth largest video site by audience size, built organically from social link sharing and embedded videos. And TubeMogul's research shows that on average viewers who begin watching videos on social platforms are more engaged; they watch longer than viewers who arrive from other sources. And new research from Pew Internet & American Life Project suggests that millennials will make online sharing a lifelong habit. As consumers embrace personalized "pull" technologies like RSS feeds, social filtering, and optimized recommendations, inbound marketing tactics have evolved to respond to the changes in consumption behaviors. Using players that have exposed embed code and built in social sharing links can make it natural and easy for viewers to pass your video along to their friends or followers. And when you use a robust player like Brightcove, the branded player experience travels with the embedded video to drive viewers back to your brand. When implemented with the right triggers, video has high potential to drive viewers back to your own site. Embedding linked logos in your players that show up wherever the player is embedded helps signal to viewers that your brand is associated with the content. You can also put links back into the video information details, though those are not as direct and upfront to drive viewers back. Another great traffic-driving tactic is to plant teaser videos with just 30 seconds of content on heavily trafficked sites that encourage viewers to access complete episodes or libraries on your own site. Hulu is in the business of being a hub for produced entertainment content, but they leverage the heavily trafficked YouTube channel to pull customers back into their own site. 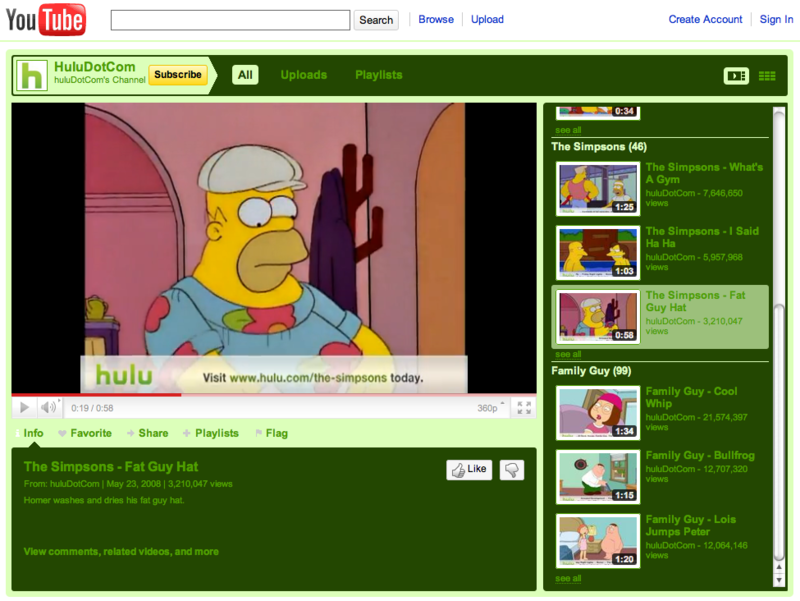 Below, the persistent banner directs viewers back to that Simpson's episode gallery on hulu.com. Syndicating your videos out on other sites can also contribute to your inbound SEO by building links and connecting traffic, whether you are working with partners or allowing organic spread with social sharing. Inbound marketers rely heavily on metrics to measure the effectiveness of their efforts. Thankfully, hyperlinks on the web have infinitely improved trackability compared with old school marketing efforts. Marketers can now match videos to specific traffic patterns, watching for referring sites, traffic sources, and even page views with the ability to monitor average time spent on pages. Videos, either on external sites or on your own sites will drive those numbers up by putting links back to your company's page where compelling content lives. Regardless of your video's production value (DIY Flip Camera footage to heavily produced professional content) but it's easy to make the ROI case given how cheap it is to push video anywhere when embed code is just a copy and paste away. Given that it's all traceable, you can easily measure the impacts on traffic, and then on conversion as you begin to use video for inbound marketing. For more ideas for marketing with video download our white paper on B2B Marketing with Video: Driving ROI from Awareness to Advocacy. Sara Marie Watson is Brightcove's Online Video Platform Evangelist. She tweets @smwat.